Before you sign the bill of lading accepting your delivery, have the driver wait while you OPEN ALL PACKAGES & INSPECT CONTENTS FOR DAMAGE. If you find damaged item(s) refuse only the damaged items. Call our Customer Service Department at 1-866-366-1500 and report damages immediately. Refuse any and all packages in which obvious damage has occurred to the merchandise inside said package. Example: You see a dented whiteboard through a hole in the box. Barring obvious damages, note on the bill of lading the number of packages that show signs of damage. Example: 2 of 5 boxes damaged. Do not write anything else on the bill of lading. Open and inspect all packages after driver leaves, report any and all damages immediately to Customer Service at 1-866-366-1500. We will ask for a copy of the bill of lading signed as instructed above. Once received, we will begin to process your replacement order. working days of delivery. Claims may be denied after that date. with your delivering carrier for their rules. at 866-366-1500 The trucking company will not notify us of damages. The trucking company is only responsible for taking the freight to the back of their truck. It is your responsibility to take the freight into the building. 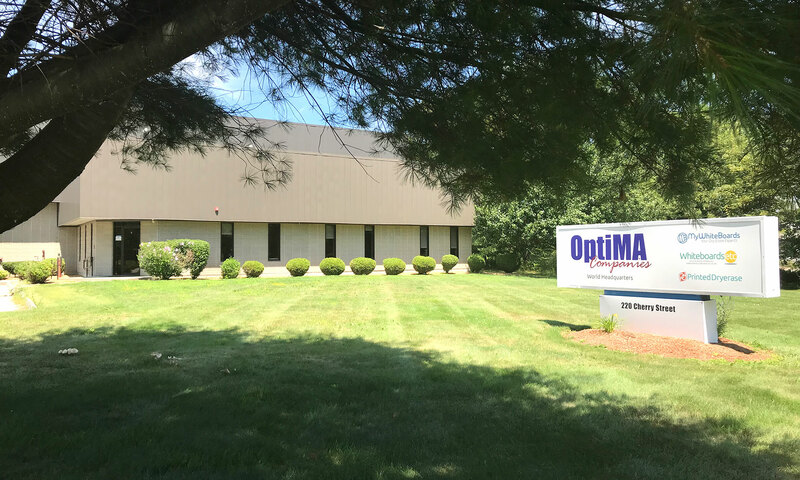 Your freight charges billed through the OptiMA Companies only cover you to this point. If you request INSIDE DELIVERY, there is an additional charge from the trucking company and you are 100% responsible for these charges regardless of the size of your order. The charges are determined and controlled by the trucking company. OptiMA has no control over this charge. You can make arrangements with the delivering carrier directly for inside delivery and they will collect the fees from you accordingly. OptiMA does not get involved with this process. If your order includes any board over the size of 33 ½ x 45 ½ your order must ship by common carrier (truck). Your freight charge for your entire order will be $100.00. If your order does not include any board over the size of 33 ½ x 45 ½ choose UPS in the shopping cart and your freight charges are computed from the UPS standard ground shipping charts. It is very important that you take time to read the Receiving Instructions above. Item(s) must be in unused and resellable condition. Item(s) must be in original packaging. Get RMA number from customer service. Ship package as instructed by customer service. Once items have been received and found to be in proper condition a refund or credit will be issued. If your return does not meet the conditions listed above please still contact us at 1-866-366-1500 and we will see what options may be available. *Custom items may include anything custom sized, custom printed, special ordered, this may include some items that are made to order which may otherwise appear to be stock items. Examples of custom units: Custom length Opti-Rite material, 5′, 6′ tall, 8′ tall boards, full height walls, horizontal slider units, enclosed bulletin boards or letter boards with custom fabric backgrounds, fabric bulletin boards and many other items. It is best to check with customer service prior to ordering if your item is considered a custom unit. We will always provide fabric samples, etc. free of charge so that you know exactly what you are receiving prior to ordering. Customer is responsible for all freight charges. This includes both inbound to your location and outbound back to the manufacturer. The items must be shipped back to the manufacturer Freight Prepaid by the customer. No Freight Collect Shipments will be accepted and the shipments must be insured for the full value of the board. Customer service will provide you with the proper address. Once the items are received, inspected and found to be in good order, a check will be issued or original credit card will be credited for the amount of the returned items. It is normal to have credits take several days to appear in your account. Our normal lead time for magnetic items and accessories is usually 3 to 5 business days. Our normal lead or production time for boards is 10 to 15 Working Days. This means that your order will leave the factory in 10 to 15 working days. You still need to add transit time to your location. Some of our boards are denoted as “Quick Ship” items and we try our best to ship these boards out in 3 to 8 working days. Quick ship items are NOT guaranteed to ship in this time frame. At certain times of the year, we are so busy trying to keep up with school orders and exceptionally high demand that even “Quick Ship” items may be delayed. Summer months of June – September our lead time may increase to as much as 3 to 6 weeks on certain products because of increased demand. We do our best to build our inventories before the rush season begins. Please plan accordingly. If you have a combination of both “Quick Ship” and Non-“Quick Ship” items your order will be held until it can ship complete unless you are willing to pay the freight for two separate orders. We will not pay freight on a split order regardless of the dollar volume if you request a split shipment. OptiMA Inc. will pay all Freight Charges on orders totaling $1,200.00 shipped within the continental United States*. There is a $50.00 fuel surcharge added to the order. If your order includes any board over the size of 33 ½ x 45 ½ your order must ship by common carrier (truck). Your freight charge for your entire order will be $125.00. If your order does not include any board over the size of 33 ½ x 45 ½ choose UPS in the shopping cart and your freight charges are computed from the UPS standard ground shipping charts. It is very important that you take time to read the Receiving Instructions above. *Custom printed dry erase boards not eligible for discounted freight.